Cult skincare brand GlamGlow knows a thing or two about getting a glowing complexion, and what better way to put that expertise to use than by putting its stamp on the makeup industry? The brand, which is known for its glittery face masks, has unveiled its debut hybrid beauty product, a trio of highlighters dubbed "GlowPowder." 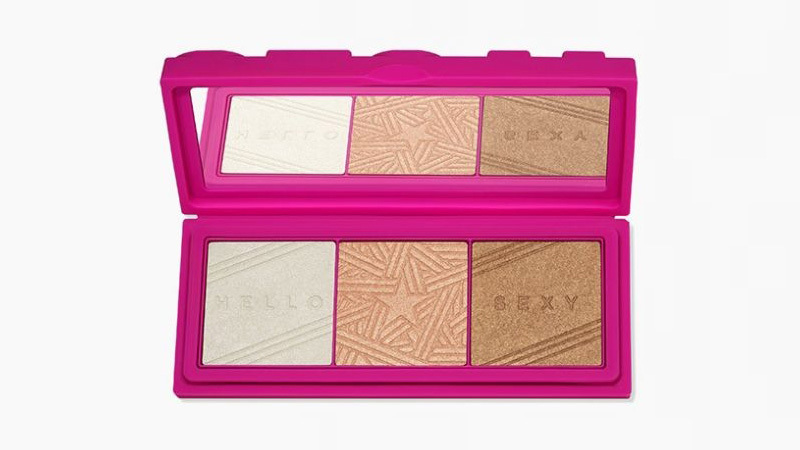 Featuring a pale cream shade, a warmer rose tone and a shimmery bronze, the highlighter palette has been designed to improve the skin in addition to providing a sunkissed glow. The buildable formulas mean the colors can be worn separately or together, for a custom look. As a combination of hyaluronic acid and golden clay, the highlighters claim to "smooth, refine, and enhance" the skin, as well as diffusing light and blurring imperfections. The product can also be used on the body, with the shimmery powders perfect for dusting everywhere from cheekbone to collarbone. Hybrid skincare and beauty highlighters are becoming a major beauty trend this summer. Earlier this month, luxury skincare brand Kiehl's unveiled its "Glow Formula Skin Hydrator," which delivers a short-term dose of illumination and acts as an instant highlighter, while Marc Jacobs Beauty's new summer makeup collection "The Coconut Fantasy" includes a "Dew Drops Coconut Gel Highlighter" that contains both coconut milk and coconut water for an intensely hydrated complexion and a warm, rosy gold glow.